"If you see anyone on the list who is no longer missing please contact us so their name can be removed." The despair wrought by California's enormous Camp Fire is reflected in the state-record death toll, 81, the huge rolls of destroyed homes, more than 12,000, and — each night since the fire broke out Nov. 8 — the fluctuating number of missing residents. The Butte County Sheriff's office reported that as of Tuesday, 870 people remained unaccounted for, posting a list of their names at the top of the sheriff's website. That's 406 less than when the list peaked Saturday at 1,276 but still 171 more than when the total dipped to 699 on Monday. Investigators attributed the increase in the total number declared missing to the fact they were “able to work through a backlog of voicemails” from the public. 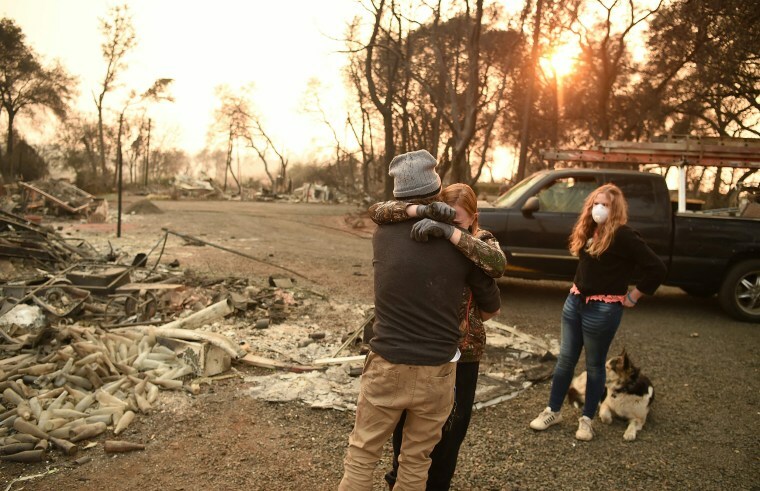 Sheriff Kory Honea said the disruptive nature of California's deadliest wildfire has meant that, nearly two weeks after the blaze broke out, family members are still tracking down loved ones. But reports of those who have been found have not always filtered back to law enforcement authorities. The list of names is compiled from three sources: the sheriff's office missing call center, emails to officials and reports called into dispatch, according to NBC Sacramento affiliate KCRA. Honea and his office have not provided a detailed description of how the list is compiled. But he has told the media that one problem in accounting for those who are safe may be that some unofficial shelters have not passed on complete lists of those staying with them. The sheriff has defended the list, while directing residents to help bring down the total by alerting the sheriff's hotline if they are mistakenly counted among the missing. "If you see anyone on the list who is no longer missing please contact us so their name can be removed," the sheriff's office says on its website. But it asks that information be phoned in to the Missing Persons Task Force, not emailed, listing the hotline numbers as 530-538-6570, 530-538-7544, 530-538-7671. "It's difficult because we have a catastrophic event and a massive number of people are scattered across Northern California," Honea said in one interview. He added, in another: "I can't let perfection get in the way of progress." One indication of imperfections has come from families, who have said they do not see their loved ones on the list, even they have been reported missing. A woman in Tennessee told the San Francisco Chronicle that her mother hasn't been heard from but did not appear on the list. Chrissy Mullinax told the newspaper she reported her mother missing to the Sheriff's office 10 days ago. But it was a posting on Facebook that helped locate the elder Mullinax and confirm that she was okay, her daughter said. "They're doing much better than the [sheriff's] hotline," Mullinax said. Authorities have declined to speculate how many of those listed as missing might have died in the fire, which had burned 151,000 acres and 12,637 residences as of Tuesday morning, according to the California Department of Forestry and Fire Protection. Butte County officials decided to compile a list of those believed to be missing in hopes of getting the public to report those who made it out of the fire safely. Authorities in previous disasters have not always published lists of the missing. In last year's Tubbs Fire in Sonoma County, the sheriff's office announced it received 2,269 missing persons reports, but didn't name them individually. "We knew it was changing minute by minute," said Sgt. Spencer Crum, spokesman for the Sonoma sheriff. "It was extremely fluid and we didn't want to have any misinformation out there and we knew there would be errors." Crum said his remarks were not intended as a criticism of Butte County's list. "They are two different counties, with two different populations and two different fire scenes," said Crum. "I wouldn't second guess anything they are doing."